This morning Matt Boch, the creative director for Fantasia Games, uncovered of possibly terrifying reality for iOS emoji addicts; you may accidentally be sending your friends an emoji of a hairy heart. It turns out when iOS users send a yellow emoji heart to the phone of a friend (or enemy I suppose) the emoji may show up as a hairy heart. Naturally we felt compelled to test this reality. Our very own Mike Wehner tested it out by messaging his beloved HTC One from his iPhone and was unable to replicate the results. The theory was seemingly debunked, until we got the results of our back up experiment. Behold. It turns out on some Android devices iOS emoji don't show up as they're intended. Ultimately this shouldn't cause people too many problems, unless you're in a really complicated relationship where a hairy heart has some form of symbolism we're missing out on. That doesn't mean unknowingly sending the wrong emoji isn't slightly annoying. Apparently Matt Boch was also wondering about this issue, so he did a little research with the phone he initially discovered the quirk in. 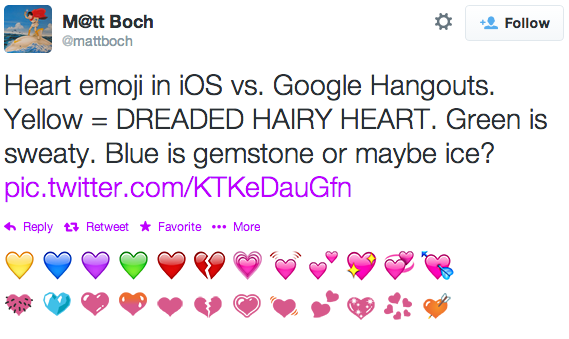 He found a number of iOS emojis that showed up differently on his Android device, though none of them are quite as different as the yellow heart to hairy heart conversion. So use caution dear readers. We're living in a scary new world, one where we cannot trust that emoji we're sending is truly the emoji that will be delivered. If you're worried there's really only one solution: Go back to using words.